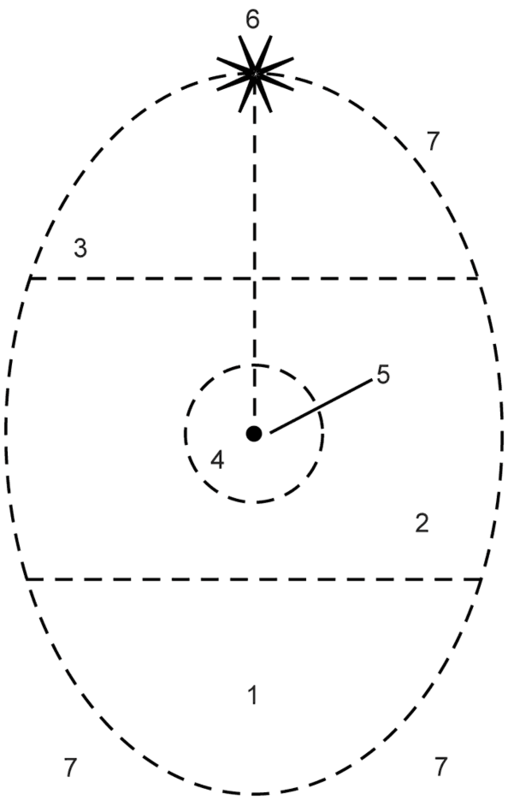 Psychosynthesis Egg of Being or "egg diagram"
Ecopsychology is not defined by any one person, by any one discipline, by any one method. Put simply, it is a bridge between ecology and psychology and whatever comes after this is up to a psychologist’s or ecologist’s own “perspectives and interests”. The Earth Sanctuary, where I live and work, is made up of people who have experience with Psychosynthesis (among other things). It is through this, and other experiences, that we hope to approach Ecopsychology. What can Psychosynthesis do for Ecopsychology? The principle of synthesis for a start. Although Psychosynthesis is perhaps not very different from some other schools of psychological thought (its inclusive nature in fact incorporates many ideas and practices into it) it tends to talk about synthesis, mainly the synthesis of the personality, where we find ourselves having to adapt our personality to suit our situations. Psychosynthesis takes the resulting “subpersonalities,” as it calls them (a similar concept in Gestalt Therapy talks of “creative adjustments”), and through recognising and integrating them they might be reconciled with the whole of the personality. One such subpersonality or creative adjustment may be the suppression of an ecological identity or ego. Many urban people are so submerged in a human environment that they have lost an ecological perspective which has usually been a natural and healthy part of human existence. If we are to live harmoniously with the planet then one psychological work is to reintegrate this wider, more-than-human, perspective as a part of us by seeing ourselves as a part of the more-than-human world. One exercise in Psychosynthesis is to draw your personal life history from present to past, to get a sense of your development through your life, seeing it as a coherent process rather than just a string of random events. This same exercise may be done with how humans have appeared in the universe. In one book I have, called Thinking Like a Mountain, there are a few meditations that try to facilitate just this, guiding us through various images that link us back into the natural processes of cosmic and ecological evolution. After all, humans belong in this universe because its laws and evolution make us possible. James Lovelock also did his own synthesis on the Earth’s evolution, but more as a scientific exercise than a meditation, in The Ages of Gaia. These can help us to gain a perspective on the history of things and help us re-identify ourselves as a part of this history, synthesising our presence within the greater whole. With the current atmosphere of globalisation, human history is undergoing its own process of global synthesis, where we can look back and see the various stages we have gone through as a coherent process; from our evolution in and dispersal from Africa, and subsequent diversification, to our current reconnection across the globe. Psychosynthesis has tools to help us see that cosmic, ecological, human and personal evolutions are part of a coherent, synthesised, process. In Ecopsychology there is a concept called the ecological unconscious, described as “the living record of cosmic evolution, tracing back to distant initial conditions in the history of time.” (Theodore Roszak, The Voice of the Earth). The structure of it has been determined by the nature of our universe as well as the psychological evolution of our species and beyond to the start of life. The previous ideas about identifying with ecological and cosmic evolution can help us reconnect with the ecological unconscious within us. But we have to be careful that this reconnection to the “bigger picture” doesn’t mean regressing or becoming a mere product in its unfolding. We can, instead, be a positive contributing factor in our personal lives and as a species. The ecological unconscious is something new to Psychosynthesis, its model of the human psyche, called the Egg of Being, describes several “types” or “aspects” of the unconscious but nothing explicitly ecological. So where does the ecological unconscious fit into the Egg of Being? At first, because of its description as something related to the deep evolutionary past of life and the universe, I thought that it could be in the lowest part of the lower unconscious (1) which can represent the individual psyche’s unconscious past or the physical body. Unfortunately this is still not a very whole picture, it still leaves the middle (present/emotional-intellectual) unconscious and especially the upper (future/spiritual/transpersonal) unconscious as somehow not related to what the ecological unconscious represents. Our choice then remains to either regress when connecting with the ecological unconscious or to detach from it when pursuing “higher” evolution. In either case it fragments the psyche, “dissecting” the Egg of Being. Since the ecological unconscious is a developing model, there is room to look at in various ways as people define it as it best works for them. The Egg of Being model is quite versatile in that it doesn’t just have to represent an individual but also can be used to look at the psychological dynamics of various things, such as human groups. We can also use the Egg to look at the ecological unconscious and give it not only a deep aspect but also a higher aspect of spiritual or transpersonal evolution. This is made possible because the nature of the universe includes this potential within it, not as something imposed on it from “out there” in some spiritual dimension separate from our universe. Therefore humans represent a part of the unfolding potential of the universe, emerging within the living Earth just as a flower might, and also within the human psyche the ecological unconscious can be seen to somehow be “omnipresent” providing it with its structure and evolutionary potential. The whole process of the psyche is embedded in the ecological unconscious. To put it into other terms, personal and human evolution of the past, present and future, are all a part of the universe’s own evolution. Our physical, intellectual, emotional and spiritual evolution are contained within the greater picture of the universe’s evolutionary processes especially that of the living Earth’s, though it is by no means diminished for being so. Psychology shouldn’t just be about therapy and healing, it should also be about how we open up to and develop our “higher” potential. Many people have worked with this in mind when working with Ecopsychology, sometimes calling it Transpersonal Ecopsychology or Econoetics, which you can find on the internet. Psychosynthesis can be one contribution to this, facilitating every level of our evolution and integrating that into the wider ecological evolution of our planet of which we are a part.